Our return from Kruger to Richards Bay was further west through lower parts of the Drakensburg mountains and the Battlefields region of Kwazulu-Natal. 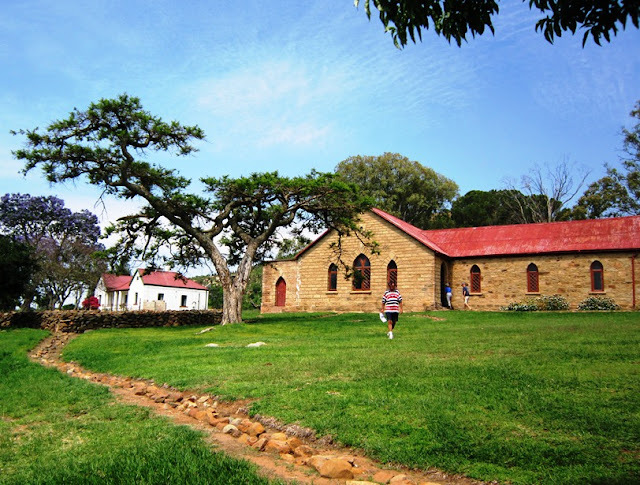 The scenery of the former is lovely with beautiful sweeping forested hills, while the history of the battlefields was intriguing and critical to the history of South Africa. In quite a small area between the mountains that mark the border with Lesotho and the sea there were literally a few dozen significant battlefields from a period of not much more than 60 years. Zulus, Boers,and British - pick all of the possible combinations and you will find where they fought. We only had time to visit a couple of these but a history buff could lose himself here for weeks. 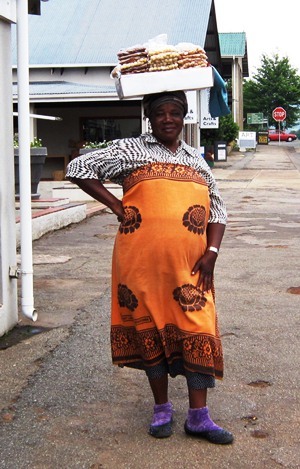 This delightful lady was selling various kinds of nuts on the streets of Grakskop near the Blyde River Canyon. This small tourist town has a restaurant, called Harrie's that has raised the making of pancakes, sweet and savoury, to an art form. You could drop this restaurant into any great Western city and it would be a big success. 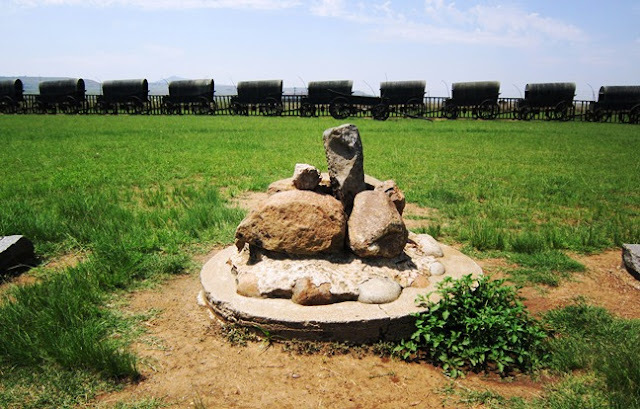 This monument is at the scene of the Battle of Blood River where a party of 470 very well-armed Boers destroyed an attacking army of between 12,000 and 15,000 Zulus who bravely, but suicidally attacked a heavily fortified ring of wagons. This monument is almost a religious shrine for South Africa's Afrikaner population who are descended from Boers. A little bit of the back story is needed to understand this battle. The Boers (Dutch-German .mainly) were the original white settlers of South Africa. When the British took control of the colony they decided that they would leave the areas where they had lived to the south and west and head into was is now KZN and Free State provinces. They went in epic wagon train journeys in what are now called voortreks. In this part of KZN their leader, Piet Retief arranged for the purchase of land from the Zulu leader Dingane. At the end of the successful negotations, Dingane had Retief and his party murdered BTW, Dingane was not a nice guy. Earlier he had killed his half-brother, the legendary Shaka. The Zulus then attacked Boer farms and killed about 500 farmers, their families and servants.The Boers responded to this outrage by sending a 'commando' to attack the Zulus. The commando even had two (or perhaps three) small cannons with them along with many rifles and much ammunition. 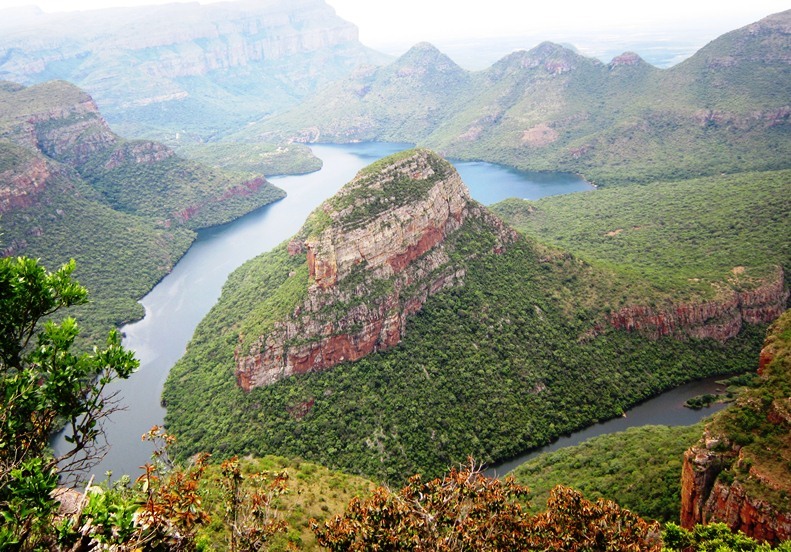 At Blood River, the Boers chose the place of battle very carefully with a river on one side and a deep ravine (donga) on another. The Zulus always used the same battle tactics with a battle formation like a buffalo's horns with two encircling elements surrounding a powerful central force. Because of the terrain, the could only attack from one side. This illustration shows Boer cavalry leaving the laager late in the action to chase fleeing Zulus, killing so many trying to cross the river that the water went red. Something like 3000 Zulu were killed while the Boers had none killed and only a few wounded. Note that inside the laager are the many oxen used to pull the wagons, along with horses. This pile of rocks marks the centre of the Boer's laager. 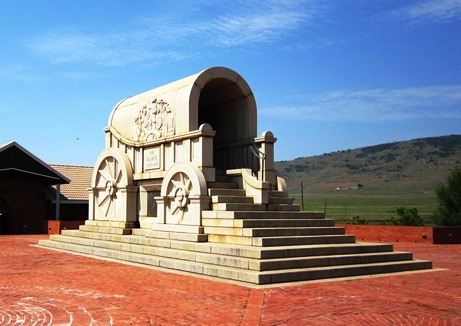 Around it, during the time of Boers, a life-size ring of bronze wagons along with the fencing used to connect the wagons was built as a monument to the battle which became a centre-point in Boer nationalism and the belief that there was a covenant between God and the Boer people that gave South Africa to the Boers. The SA government have now built a museum across the river to memorialise the Zulus who were killed here.We tried to drive there but the road was just too rough for our heavily loaded Hyundai. BTW, James Mitchener's novel, "The Covenant" is highly recommended if you would like to know more about South Africa's history including the story of the Boers. The British seemed not to have learned the lesson of the Boer's incredible victory in 1838, that is to keep your forces massed in one place and let the Zulus attack you. They sent a force into Zululand in 1879 to put down a Zulu revolt but allowed their forces to get spread over a large area near Islandlwana. This meant that the Zulus were able to attack small elements individually. The result was one of the worst British defeats ever. Meanwhile, about 10 km away a tiny British garrison of only 140 were left to defend a field hospital and supply base after a few hundred native soldiers left. The force here was led by a military engineer and included the commissary department, and the wounded from the hospital. One thing they did have was lots of supplies so they built defensive walls from the hospital to the store using mealie (corn meal) bags. In case they could not defend this perimeter they built a second wall from biscuit tins that would allow them to only have to defend about a third of their small area. Finally, they built a tiny circular redoubt (perhaps 3 m in diameter) if the inner wall fell;. They did this because they knew that the Zulus did not take prisoners. 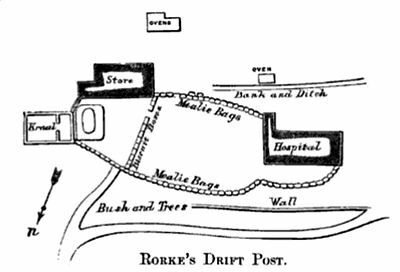 Between 3,000 and 4,000 Zulus attacked Rorke's Drift over two days, but the bastion did not fall. By the time that the Zulus withdrew, the garrison was almost out of ammunition for the modern Martini-Henry rifles that were their salvation. The army gave out a remarkable 11 Victoria Crosses to the defenders. A British general thought this was excessive since the defenders were fighting for their lives and really had no choice but to be courageous and hence did not deserve such an exalted medal - an interesting perspective to be sure. Some observers say that the large number of VCs was to draw attention away from the disaster at Isandlwana just a few miles away on the same day. This is what Rorke's Drift looks like today. The buildings were not there during the battle. The stone trench marks one of the mealie bag walls. It is hard to reconcile this peaceful setting with the savagery of the battle that took place here. 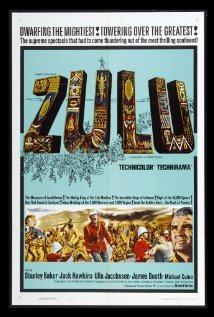 This is the poster for the 1964 movie, Zulu, which is based (more or less) on the Battle of Rorke's Drift. It was Michael Caine's first big role - he was a remarkably handsome young man btw, June notes. Zulu was a big commercial success. Zulu Dawn, released in 1979 told the story of the Battle of Islandlwana. In spite of a first-rate cast including Peter O'Toole, Burt Lancaster, John Mills and Bob Hoskins it was not very successful - going to show that audiences want to see victories more than defeats. We got this picture from our friend Lew. 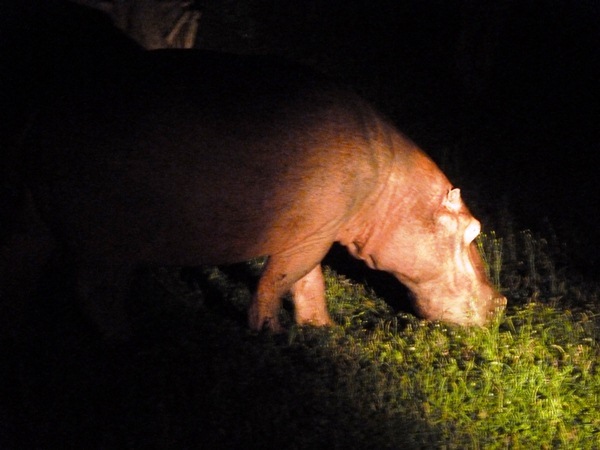 This is the hippo that is reputed to be the one that bit off a man's leg in St Lucia. The guide who told us that said that they killed a hippo after the attack, but it was the wrong one. The now dead hippo was a quiet sort who had been in the town at night for more than 15 years. We saw this guy on our way home from dinner one night (we drove even though it was not far). The next night he was right outside our guest house driveway. And I thought that the raccoons that frequent the streets of Toronto at night were a problem. Posted by Bruce at 2:51 p.m.